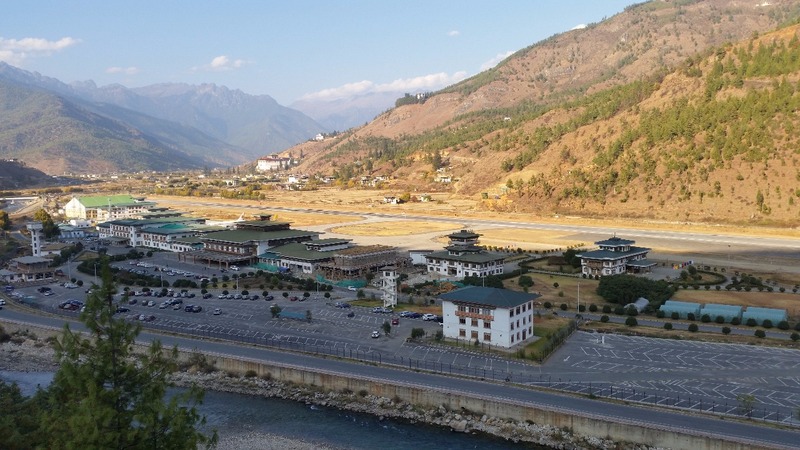 A significant number of travellers visiting Bhutan start their Bhutan trip from Paro, as it has the only airport in the country. A very small place, the whole town is visible from our balcony at Hotel Mandala Resort, which is located at an elevation. 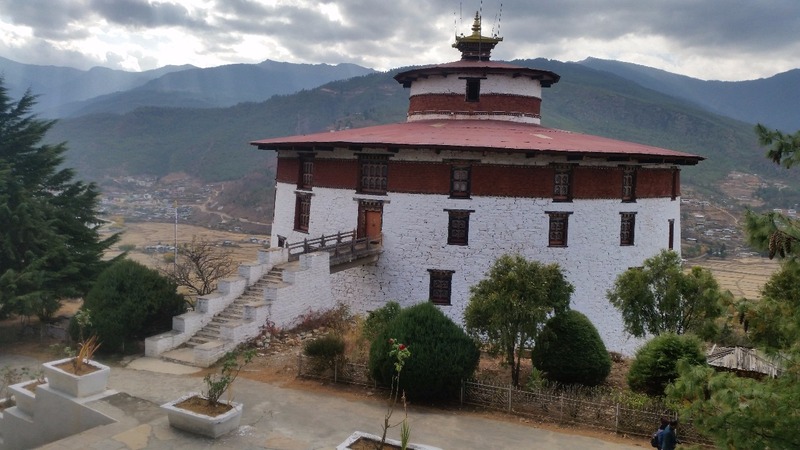 At night, the Paro Dzong as well as the watchtower at the museum which are illuminated stand out in the dark surroundings of the mountains. We have a bird’s eye view of the city when we are approaching it from Chele La. 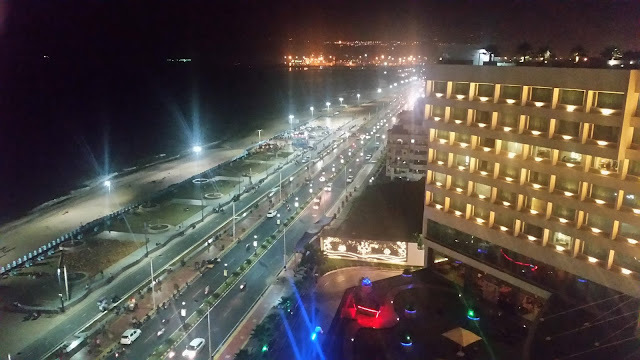 There is a viewpoint where you can see the city on one side and airport on the other. The market is in the main area of the town, hardly two streets with a handful of shops. 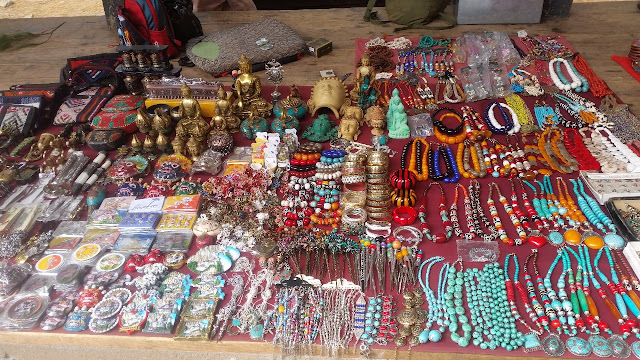 However, shops here sell the most exquisite stuff in Bhutan, be it dresses or handicrafts. 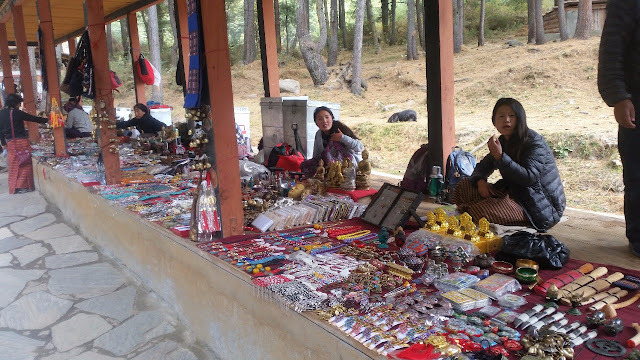 If you are interested in buying a traditional Bhutanese dress, this is the place where you get variety. As I said earlier, I have been pestering Karma, my driver, for Yak meat, and finally, here he takes me to a place serving Yak. 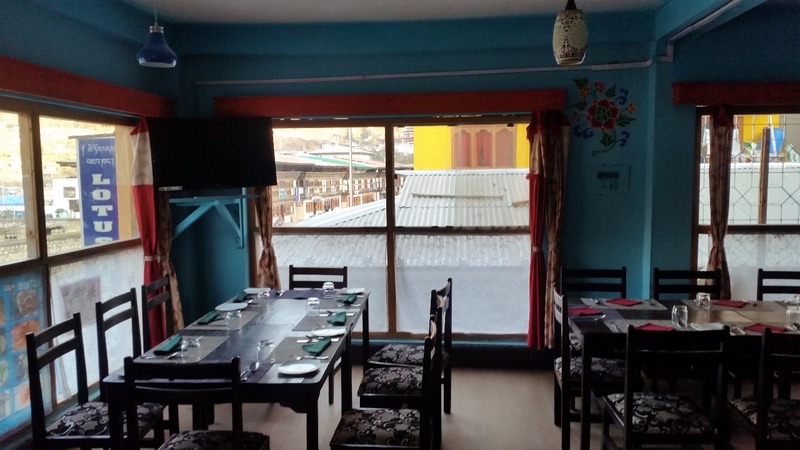 Lotus Bistro Restaurant is located at one end of Paro market. 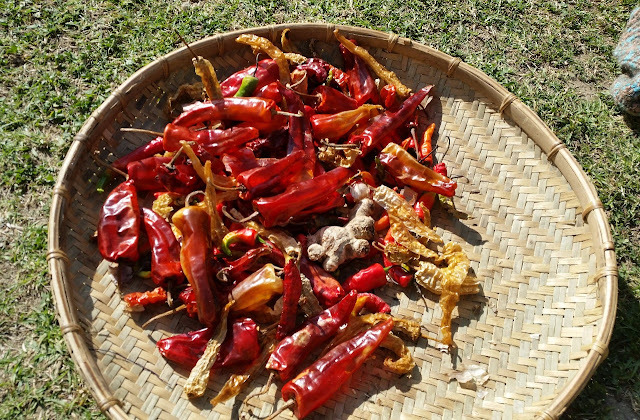 The proprietor Jeevan is very hospitable, and agrees to cook Yaksha Pa or yak meat for us on request. The meat is served with red rice and ezey accompanying it as is the custom. 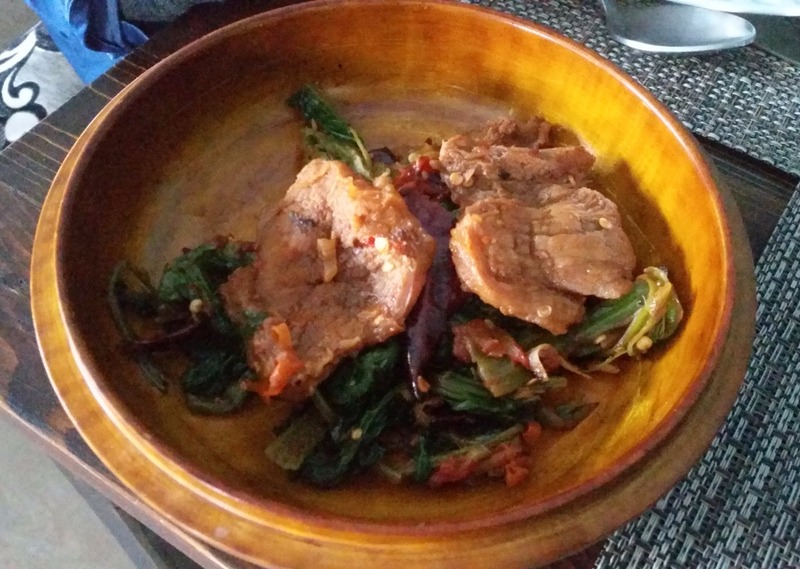 Pa here is served with leafy vegetables instead of the more common radish. My wife gets a tutorial on how to make a radish based salad using ezey. 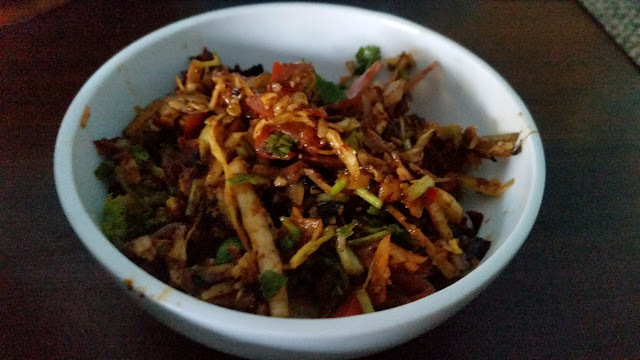 The yak meat pieces are large, slightly chewy, but nevertheless, it is an experience. 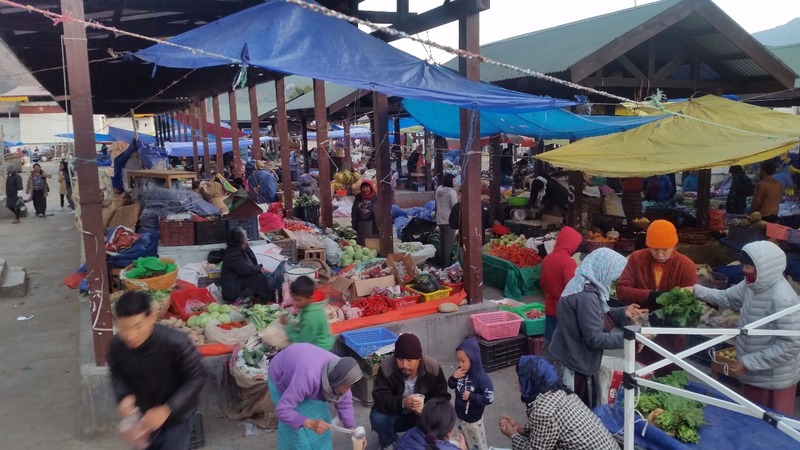 We visit the local market next, looking at the variety of fruits and vegetables here. We pick up two varieties of chillies and red rice to carry home to India with us. 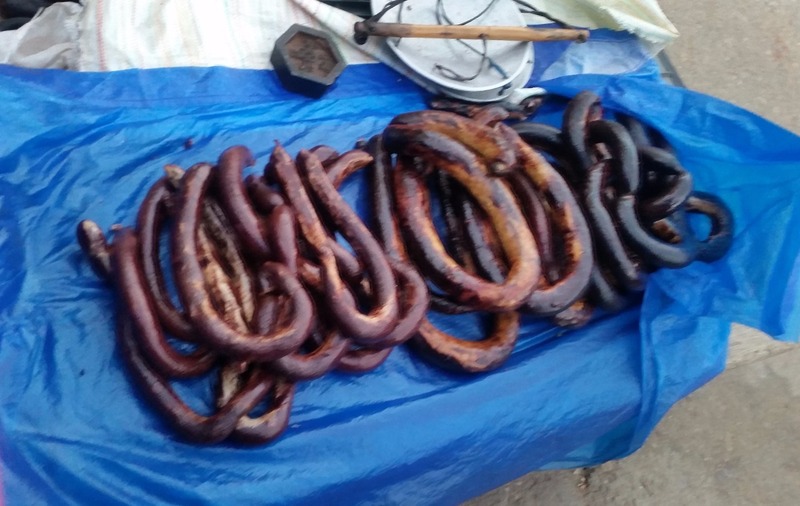 Huge yak sausages are being sold at one side of the market. It is a pity we cannot taste these as no one could guide us to restaurants selling cooked versions of these. 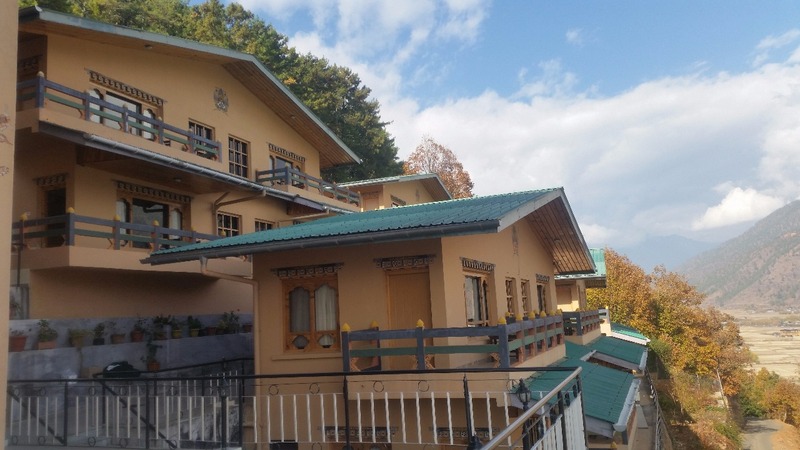 Tiger’s Nest or Paro Taktsang is perhaps the best-known monument in the entire Bhutan. It is located on a high cliff and one has to trek for 3-4 hours to reach there. 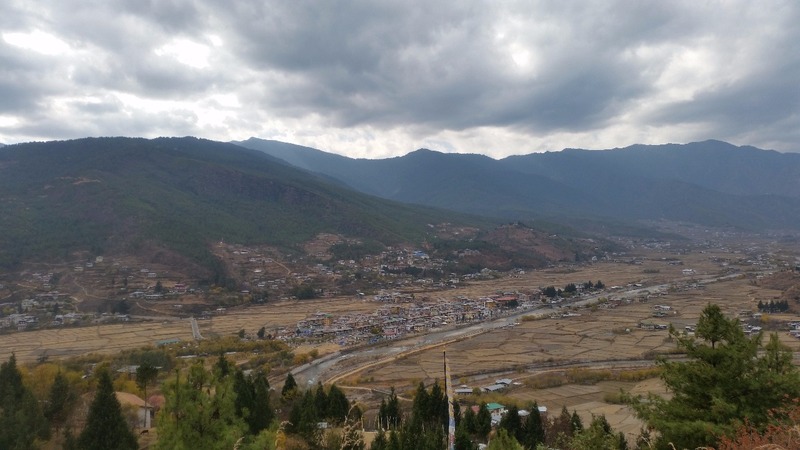 The temples were built in the seventeenth century and Guru Padmasambhava Rinpoche who is credited with bringing Buddhism into Bhutan used to meditate here. As we are in Paro only for a day and want to see the other places as well, we only travel to the base of the cliff, from where you only get a bird’s eye view. Local women have stalls selling stuff like chains, bangles and souvenirs there, and we pick up quite a bit of stuff from there. You can drive a hard bargain here unlike the main market. 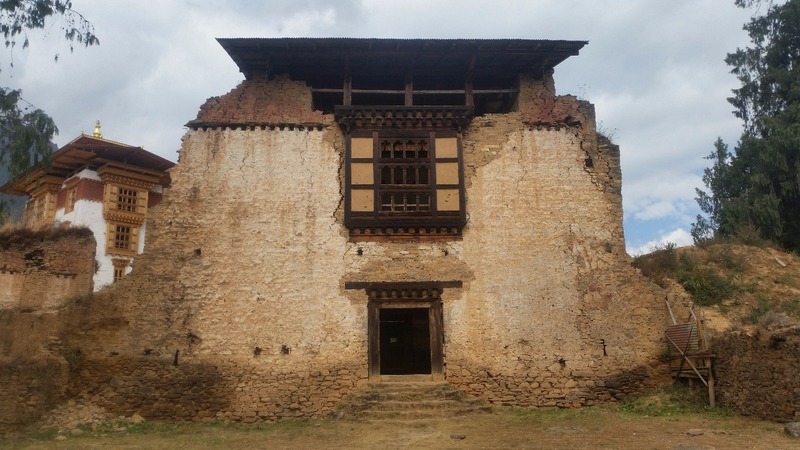 Drukgyel Dzong is an old fortress now in ruins. We climb up the hill to have a look at it. 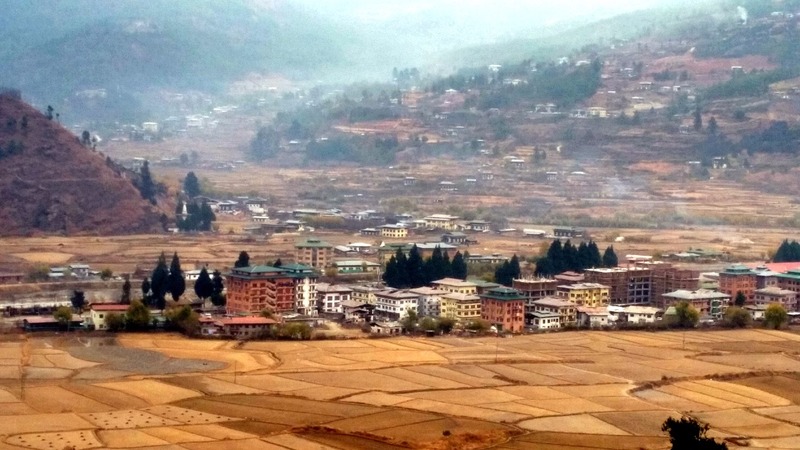 The Bhutan government is in the process of renovating this place. Till this is done, I suggest that this monument can be skipped. We also visit the Kyuchu Lakhang monastery. The place has an entrance fee of Nu 300 too. The most impressive building in the city is definitely the Paro Dzong. 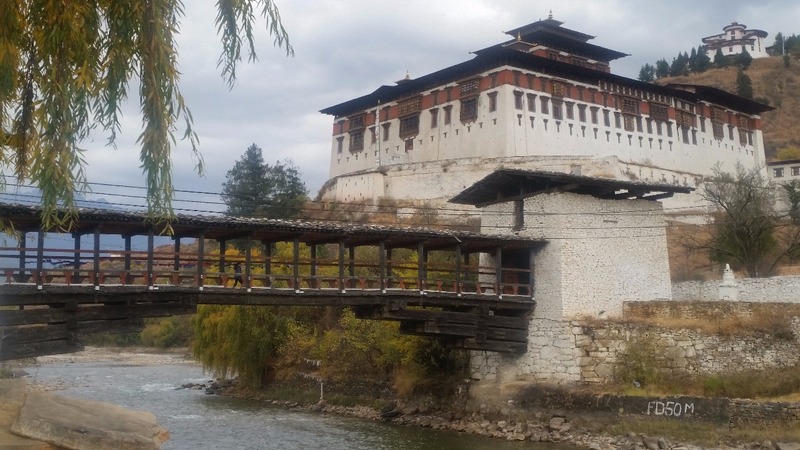 The place is also known as Rinpung Dzong which means fortress of the jewels. 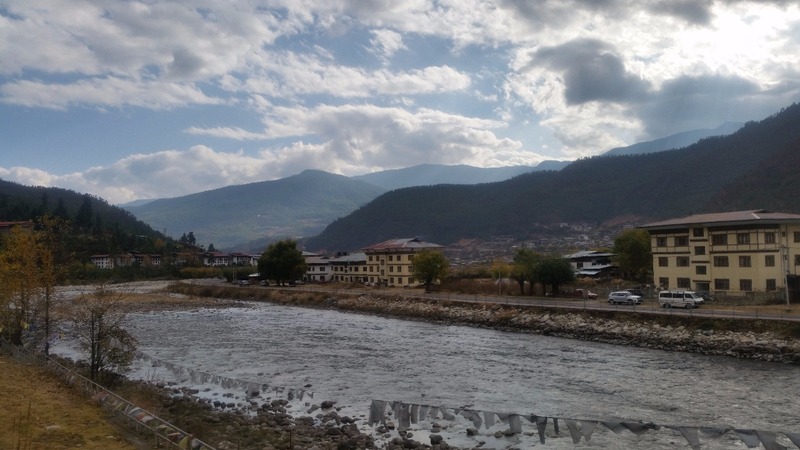 The Paro Chu or river flows next to it, and the riverside is a good place to relax. Across the river, there is a place where tourists can get their photographs done in Bhutanese national dress. If there is a must visit place in Paro, it is the National Museum of Bhutan. This was earlier located in a huge watchtower, which was damaged during an earthquake in 2011, and since then the museum is housed in an adjacent building. The museum has an impressive collection of stuff from all aspects of life, as well as masks and statues and gives even a detailed idea about the flora and fauna of the region. 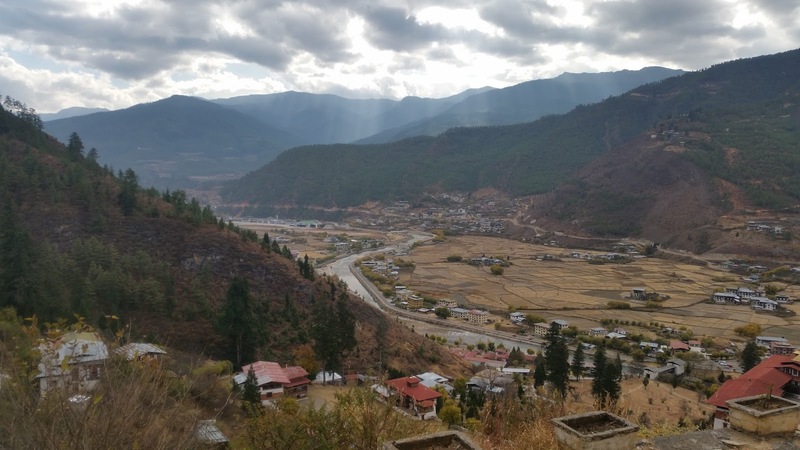 The location is another impressive viewpoint for the entire Paro city. 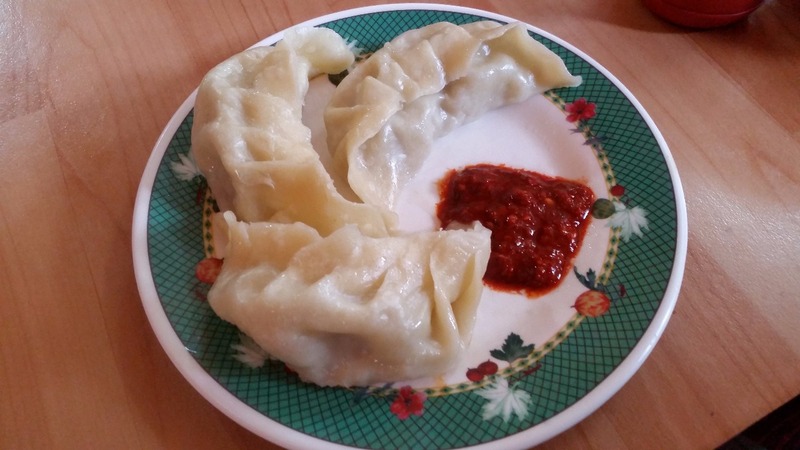 We also visit a small place called Drukpa Restaurant near the market which is known for its huge momos. 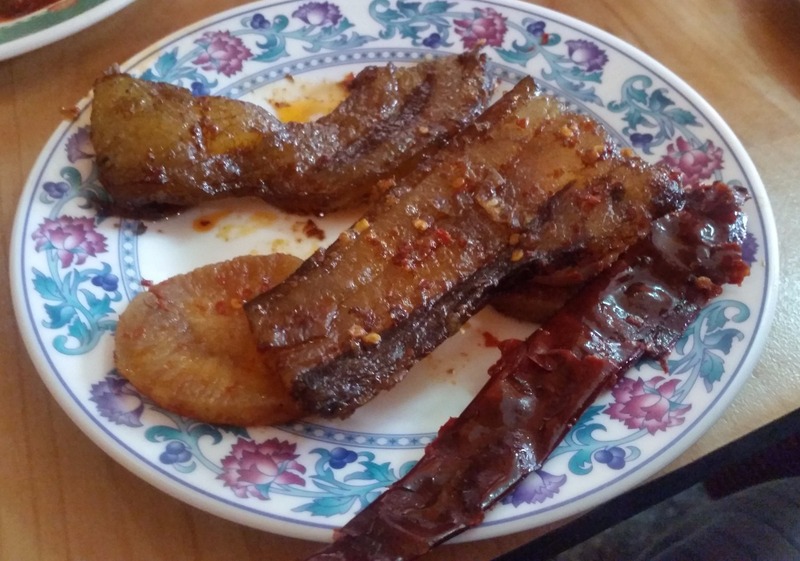 We also try Sikam Pa, a dried pork preparation here. While the quality of pork in Bhutan is good, there is too much fat added to the dishes leading to my discomfort. 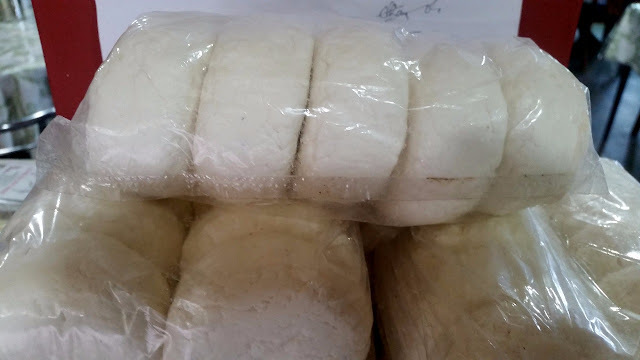 Unless you like lard a lot, it may be better to stick to beef dishes. A speciality here is a Beef Rib dish, as well as Gep made from intestines. 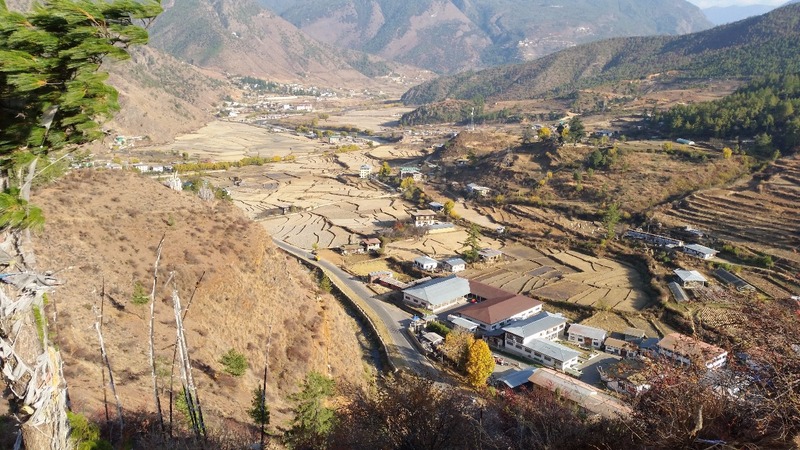 Paro is a nice quiet place to laze around for a few days. It was a pity we could only manage a single day for it. The marketplace area is nice to hang around, and it the evening the whole city glows providing a beautiful view from the top. Next morning, we start our descent to Phuntsoling and then Bagdogra for our flight to Hyderabad. But the week in beautiful Bhutan will surely be remembered by us for a long time to come.